With the media coverage on climate change ebbing noticeably after the COP21 summit at the end of last year and the honeymoon period likely to stretch on for some time, it might be a suitable moment to pause and reflect on some longer-term, structural trends that shape the illustration of climate change in the media. The scientific climate change discourse is mystifying to the average person not steeped into IPCC jargon and the political spinning of the topic. It is marred with technical and statistical complications and entrenched, ideological battles. Particularly readers from places largely unscathed by the effects of climate change today may struggle to conceive how a phenomenon so remote (both in space and time) may impact on their very lives and might ponder which importance to attach to climate change more generally. 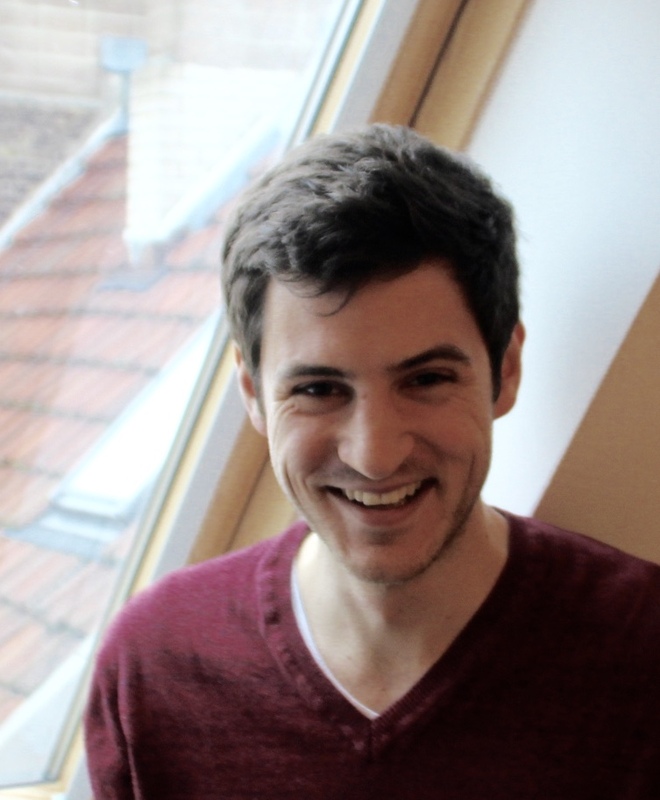 One purpose of my research was to explore the mechanisms that the German weekly newspaper Die Zeit employs in its climate change reporting in face of these complexities. In particular, I set out to analyse the role images assume in framing and visualizing these articles. In this blog post I would like to shed light on the data`s contribution to a gap in the existing literature, which the scholar Elke Grittmann identified in her comprehensive book chapter on the visual construction of climate and climate change in the media. In her concluding remarks Grittmann urges researchers to better understand possible geographical selection patterns underlying the visual representations of causes and effects of climate change. Previous work done by Lester and Cottle (2009) on the UK television coverage of climate change highlights the tendency to portray climate change through a national lens at the expense, as the authors reason, of animating a sense of global empathy (Lester and Cottle, p.932 in Grittmann, p.184). A recent large-scale empirical study conducted by Rebich-Hespanha et al. (2015) corroborates this finding in the context of US print news coverage of climate change. The authors use the catchy-metaphor of a “fish-eye view” (p.531) to describe how geographically and ideologically closer places are highly overrepresented in the prevailing climate discourse, which has a blind spot for far-flung places. Neverla and Schäfer (2010) synthesize a large body of literature and conclude that “nationally ‘domesticated’ images of climate development” (p.11) are another expression of reporting through the national lens as they largely follow the dominant country-specific cultural views about climate change. This research aims to explore in how far the German newspaper Die ZEIT conforms to the bespoken tendency to be “short-sighted” in its climate change coverage. Further, I am interested how images from certain countries/regions primarily depict specific CO2-emitting sectors or portray selected systems vulnerable to climate change. I analysed all 53 issues of Die Zeit from 2014, categorizing every image, graphic, illustration and chart that accompanied articles, which treated climate change as its (or one of its) central topic(s). The decision rule was to only categorize article illustrations (ads and letters to the editor excluded) that contained at least one of the following key words: climate, climate change, renewable energies, CO2 emissions, greenhouse effect, global warming or sea-level rises. In order to be included in the categorization the texts also needed to mention the keywords in a non-ancillary manner. If, for instance, the term climate change was dropped just once as part of an enumeration of policy challenges, the text and accompanying illustration was not considered. On aggregate, more than 250 images, graphics, illustrations and charts (subsumed under the term “images” in subsequent text) fit the criteria outlined above and thus were categorized for this research. Following from the geographic focus of the pictures alone it appears as though the “fish-eye view” of climate change reporting indeed finds confirmation in the data. In more than 60% of the cases that could be clearly identified as featuring a certain region the images are from Europe; three out of four images are from Europe or Northern America. Germany alone makes up three quarters of all images showing a European setting. If, however, one distinguishes between sectors of the economy deemed responsible for greenhouse gas emissions and systems affected by climate change (I follow classifications of IPCC here, cf. p.28 and p.7) the picture becomes murkier. I grouped an image in the category “sea levels” for instance if either the association was apparent from the image itself or the subtitle and/or the accompanying text established the link between the image and the category. First of all, it is noteworthy that only less than 9% of all the categorized images show greenhouse gas emitters – politicians seem to be a much more demanded subject to get in front of your camera lens if you want to make it into Die ZEIT (more on this in another blog post). Together “physical systems” (e.g. droughts, sea levels, coastal erosion), “biological systems” (e.g. marine ecosystems, wildfire) and “human and managed systems” (e.g. livelihoods, economics, food production) are depicted slightly more often, but still only make up around 11% of the images. 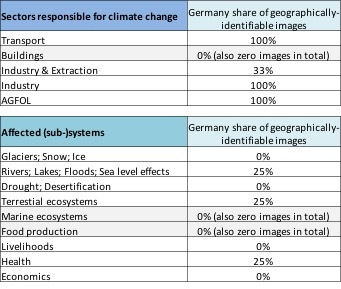 Even with such a small sample size in each of the individual categories it is striking that German emitters undoubtedly dominate the images, which depict the economic sectors causing climate change. On the other hand, the affected systems are almost all from places far away. Effects on local livelihoods, health or economics within Germany (also applies for rest of Europe) are not visually communicated to the newspaper reader. Judging from the images Germany pollutes while Latin America and Asia primarily fell the repercussions of the climate change. More results will follow as soon as time allows. Please post any suggestions below. Highly interesting insights so far. I was wondering, whether the data at hand also depicts picture/article size. If so, does size correlate with incident i.e. is there a reporting preference on the intensive margin? Also, it might be insightful to compare the sectors’ coverage to their level of CO2/greenhouse gas emissions. my apologies for the terrible delay in coming back to your comment. I greatly appreciate your ideas! I am planning to start digging into the data for a second round in the coming weeks and will keep your ideas in the back of my mind (especially if I decide to continue coding the 2016 editions of the ZEIT or another newspaper). I haven’t yet collected data on the length of the reports – that’s a very neat idea though.